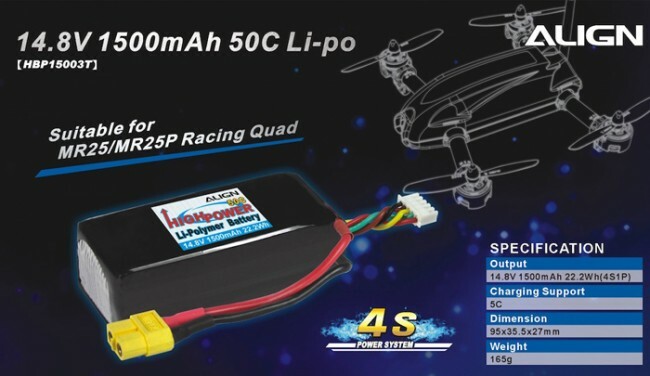 • This Li-poly battery features high efficient and high discharge, use a inspection machine to match packs, suitable for MR25 series and other professional model airplanes, cars, and guns. • Max Continuous Discharge: 50C(75A), Burst Discharge: 60C(90A). Normal operating temperature is approx. 40-65°C(within 80% of rated discharge). Max. temperature: 80°C. When using high energy Li-poly Battery, please do not over-discharge, over-charge batteries, or result over-high temperature. Discharging capacity can't exceed 80% of the max capacity after full charging to ensure a good cycle performance.Recommend to full charge a brand new battery before using and only discharge the battery 50% for first 5 times to make a good efficiency of the battery. 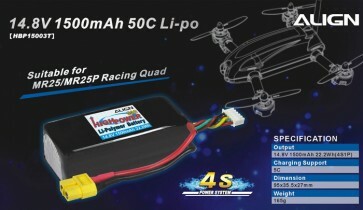 Please make it a habit to always count time for flight, or please set a low voltage protection on ESC (Cell voltage after stopping using can not lower than 3.2V). Do not use the battery at insufficient of voltage. Do not expose batteries to sunshine or store/ charge batteries at the temperature up to 35° in a airtight car. The environment high temperature could cause the damage or the danger of burst. If the battery becomes hot while high current discharging or flying, please do not charge the battery immediately. Wait to cool down(about 20 mins), then inspect to recharge. If against follow the original factory using rules, possibly cause the battery to inflate or any dangerous accident happens. • Using 14AWG wire, thermal resistance: 200°C, max continuous current 50A.